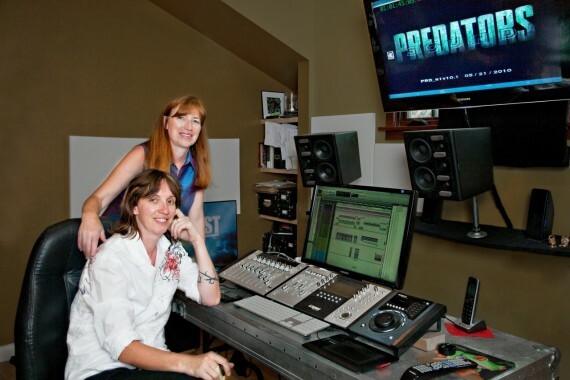 Sound designers Paula Fairfield and Carla Murray took time out to answer few questions about their work on “Predators”. They have been featured a few interviews already HERE and HERE. Stay tuned for a companinion interview with one of the sound supervisor David Stone from the original 1987 Predator next week. Designing Sound: When starting “Predators”, which was already a franchise with established and recognizable sound design, did you contact the sound crews from the previous films to discuss their work? How would you reverse engineer sounds if you had to design them without any guidance? PF: It was very important to everyone on this film that we pay homage to the original “Predators” movies in every way possible, while bringing new life and energy to the franchise almost 25 years later. In terms of the vocals for the “Classic Predator” in this movie, I listened to the work done in both previous films and tried to capture the essence of the vocal signature (the clicking, the guttural growls, etc.) while playing to the drama in this story, which often included much more intimate interaction with the “Classic Predator” than in the previous versions. All the sounds for the vocals in this film were created from scratch using a combination of human and animal source material. DS: How much creative license did the filmmakers give with the signature predator sounds and predator-vision? PF: Again, the signature predator sounds were very important to everyone involved so the process was very organic in nature. In fact, we actually started thinking that we wanted something very updated – a sort of “Predators 2.0” version – but realized that putting a different spin on all things “Predators” took the heart of the movie way too far from the spirit of the original. So, back to the drawing board I went. I worked very closely with Tim Rakoczy (sound supervisor) on the textures and nuances of the vocals and I think together, we found a formula that not only captured the essence of the original but also breathed new life into it with the help of today’s technology. DS: Totally selfish question – What is the Predator’s signature clicking sound derived from? I’ve read that it could be anything from a sperm whale to a loop grouper? PF: I don’t know what the original sound designers used but I was lucky enough to work with Joe Cappelletti’s loop group, The Final Word, comprised of some very talented vocal artists who were able to replicate the original clicking sound orally. DS: There are some new creatures (the Predator dogs and “other” predators) in the film that fit perfectly into the Predator universe. How did you guys help plant them in the Predator universe with sound design? PF: There were three categories of creatures in this film: Predators (old and new), Predator Hounds, and an alien affectionately called “The River Ghost”. All the Predators were linked through their vocal patterning, and the tell-tale clicking which was generally the sound that announced that a Predator was near. Each Predator vocal kit was comprised of an arrangement of samples from a vocal artist which gave shape to a sequence. These vocal arrangements were treated (with harmonizing and pitch-shifting) and then blended with a different selection of animal samples which were also manipulated to sit into the vocal samples. This gave each Predator a unique sound and yet the patterns of their utterances and the clicking sounds linked them together as part of the same species. The hounds are very primitive, bulky, powerful and menacing and have a variety of antlers that add to their presence. There are only a few instances where I used any human elements in their vocalizations and for the most part, they are comprised of walruses and sea lions which again were manipulated and treated to match the hounds visually. Being one of the groups of beings ‘dropped’ on the plant to be hunted by the Predators for sport, the “River Ghost” is in no way related to the Predators. The idea with this creature is that when first heard, no one is sure what it is they are hearing: ‘Is that … a bird, an insect …. what is it? Did I hear something?’ The concept for this creature was wispy and flittery and then shrieky as it closes in on its prey. DS: In interviews, Robert Rodriguez and Nimrod Antal conveyed their desire to make the jungle a character in the the film – something threatening. How did you and the rest of the effects editors achieve that with sound? PF: The idea with the jungle was to start with a place that could be somewhere on Earth. It’s fairly lush and very dense, rich with texture. There is a menacing nature to it, as the jungle can be, and yet it is somehow familiar. As we get deeper into the film, especially after the planetary reveal, the familiarity of the jungle diminishes and we start to hear creatures that we cannot place, lurking in the trees, making us wonder what is out there, what is waiting. When we finally get to the abandoned drill where Laurence Fishburne’s character is holed up, this environment becomes yet another character, a jungle of knotted pipes and steel, shifting and settling, movement reverberating through it, a menacing metallic carcass that feels like the dead heart of the planet. What was fun about creating the ambiances for this film was finding sounds that animated the spaces and enhanced the mystery. And among other techniques that I used, one thing I did was to get the loop group to do a variety of vocalizations that could be alien birds and animals for the jungle, steam and metal groans for the abandoned drill and then I processed and sonically twisted them so that they sat in the environments and became part of that world. CM: Throughout the film I was asked to design tonal beds (to underscore the music) that conveyed a sense of fear, uneasiness and suspense to underline different dramatic sequences. For example, there is one reveal on a cut to a tree where I was directed to “tease with mysterious tone design” and to make the trees/jungle “cryptic and mysterious”. Low end rumbles were also included to play under the music. Initially, the sonic location of the “jungle” was played with as the characters tried to figure out where they were and why. DS: How early in the film do you establish the predator sounds? Are there any sound hints that foreshadow they’re out there in the jungle watching/ hunting? PF: The first time we hear anything from the actual predators is after the fight with the hounds when the group discovers Cuchillo (Danny Trejo). We hear him call out “Help Me” to lure the group in, followed by the tell-tale Predator clicking, indicating that he is booby-trapped. And then as the group enters the “deathcamp”, we again hear some clicking woven into the eerie environment of hanging carcasses. Here we eventually discover the “Classic Predator” which has been strung up on a totem, crucifix-style, and then all hell breaks loose and the fun begins. The predators show up to the party, revealed in all their glory. CM: At the beginning of the film, Royce (Adrien Brody) is falling from the sky. Here, I was asked to create a tracking sound, which hints at Predator technology but is not obvious. I used sonic radar effects that were morphed into more recognizable tracking and parachute alarm beeps during Royce’s fall. Another editor also cut more realistic tracking and alarm effects. This was one of the early indications that the characters were being monitored and watched. In addition, tonal beds were created that conveyed a sense that someone was watching (from the perspective of the Predators) and fear and suspense (from the perspective of the “hunted”) throughout the film. DS: Carla, in your Editor’s Guild interview you mentioned that, “Signature design tones were created for different characters in the film.” What motivated the sounds that accompanied those characters? How did you and the composer/music editor collaborate in those moments? CM: In the Editor’s Guild I explained that I was asked to create tonal beds to underscore the music and in some cases instead of the music. I did not directly collaborate with the music composer or music editor. Much of the music and sound design were created simultaneously (I believe) due to the constraints of the film’s schedule and release date. It is my understanding that the direction for the “design” tonal beds came from discussions between the picture editor, Dan Zimmerman, and Sound Supervisor, Tim Rakoczy as well as from my interpretation of different dramatic points in the film. However, when it was provided, I did work with and listen to the (mostly temp) music track, up against my sound design. Signature design tones were created for different characters in the film. As I mentioned in a previous article, there was a “crazy man tone” for Noland (Laurence Fishburne) who was hearing voices and becoming increasingly delusional. Towards the end of the film, Isabelle (Alice Braga),who is drugged with a psychotropic, is slipping in and out of consciousness . I was asked to create a corresponding “psychotropic continuing evolving trippy design” to this scene which added to the suspense and pacing of this particular dramatic sequence. Director Nimrod Anton’s notes were to make some of the final scenes sound “weirder” and producer Robert Rodriguez’s direction was (as it always is) to “make it sound cool” which allows for a lot of creative interpretation. Another example of my design work for different characters included the “hero-rising” tonal beds and stings I created for Royce towards the end of the film. This is awesome, thanks for posting this. I just pinged David about a questionnaire for a feature, how funny. Can’t wait for it! Very nice work. I look forward to watching the film.